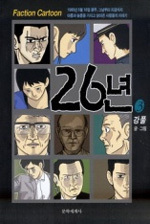 The portal site for Kang Do-young�s cartoon "26 years" was jammed after the last episode was released Sept. 28. Kang, widely known by his pen name �Kangfull,� is a famous cartoon artist whose works have gained huge popularity online. His previous works like �Apartment� and �Babo� have been made into films. "26 years," Kangfull�s latest work, tells the story of the May 18th Gwangju Civil Uprising. [...] Kangfull�s cartoon creates a fictional account of what would have happened if the victims� families took revenge on former president Chun. Five main characters appear in the cartoon; the CEO of a big company who feels guilt for his role in suppressing the revolt and four young people who lost their parents during the event. Kangfull said he decided to tell the story after former president Chun said his vast fortune had been reduced to only 290,000 won. The statement reignited anger towards the former president, who many believe has not sufficiently atoned for the pain he caused during his eight-year rule. �I wanted to let people remember the tragic incident through my cartoon,� Kangfull said.